Cozy apartment with 1 bedroom and a small room, 5 min. from the Copa beach. Connected apartment, sleeps 4 people being a double bed and a sofa bed. A bathroom and full kitchen. Air conditioning, cable TV, Wi Fi, all furnished. 24 hour concierge with security cameras, all for your convenience and satisfaction with everything that the most charming neighborhood in the south of Rio de Janeiro has to offer. Near the best restaurants and bars, cinema, theater, Ipanema beach (5minutos), beaches of Ipanema and Arpoados, Arpoador stone to take beautiful pictures of the beaches of Ipanema and Leblon and Morro Dois Irmãos. Close to the shopping centers of Copacabana and Ipanema, Shopping Casino Atlântico where you can find the most sophisticated antique stores. In station 6 we have the Copacabana Fort, with beautiful views of Copacabana and Leme. In addition to the Museum is located in the Fort, the Confeitaria Colombo where you can taste the famous snacks, breakfast and lunch. Very close to the Statues of our poet Carlos Drummond de Andrade and our most famous composers, Caymmi and Tom Jobim. Box with blindex and electric shower toilet, sink, mirror and door towels. Limpo e muito.organizado. Sônia é muito educada e uma simpatia. Excelente localização. Imóvel super legal, conservado, limpo, organizado. Super recomendo o imóvel. Além de ser organizado e limpo, a dona Sônia é muito simpática e prestativa. A localização é ótima, tem bares e restaurantes próximos. Sempre que voltar no Rio irei me hospedar no apartamento da Sônia. Imóvel bem cuidado, roupa de cama cheirosa. Muito bem localizado próximo a padarias, supermercados, restaurantes, uma infinidade de estabelecimentos. Não há garagem mas próximo ao hotel a opções de diárias por 40,00. Proprietária muito educada. Localização perfeita, pois tem acesso rápido às praias de Copacabana e Ipanema, além de estar perto de restaurantes, farmácias, supermercados, lojas e transporte público. 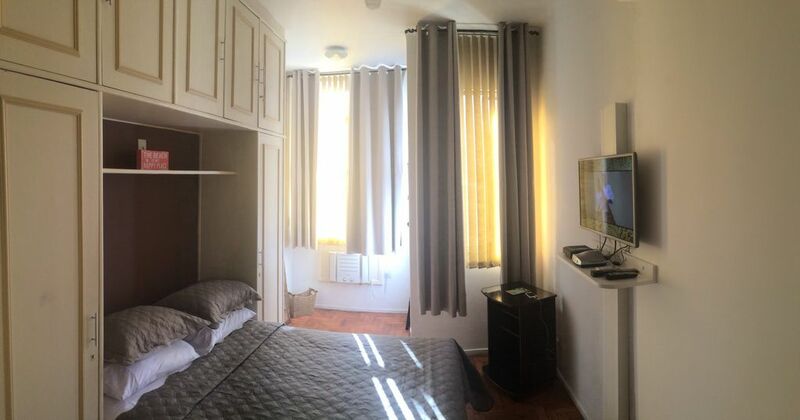 O apartamento é pequeno mas suficiente e bem equipado, além de limpo e organizado! Fomos muito bem recebidos pela Sonia! Indico e voltaria sem pensar duas vezes! You are very close to the best bars and restaurants. Banks and all kinds of shops where there are several stores of interest for women and men, adults and children. A noble area of ​​the South Zone of Rio de Janeiro with security and all the comfort that the most charming district of Brazil has to offer you. You can get around all over Rio, because the ap is close to several bus lines, and 500 meters from the subway. Also, this ap is very cozy.